A concrete building stands behind a sign that reads “CERIA,” trees and glass windows adorning it. Through its entrance and down a flight of stairs are secured doors, access through which can only be obtained via key card. Dozens of shelves holding jarred snakes, rodents, fish and insects lay beyond the door. Looking to the second floor, one can see the northern hemisphere’s third largest collection of mammals. Acorns larger then footballs and mushrooms larger than human fists can be found on this level. Underneath its foundation are teams of researchers behind microscopes inspecting parasites from the arctic. A location that is comparable to the American Museum of Natural History in New York and the Smithsonian has a home in the heart of UNM’s main campus. The Museum of Southwestern Biology, a place filled with biological specimens from all around the world, is considered one of the world’s best, according to visiting researchers. 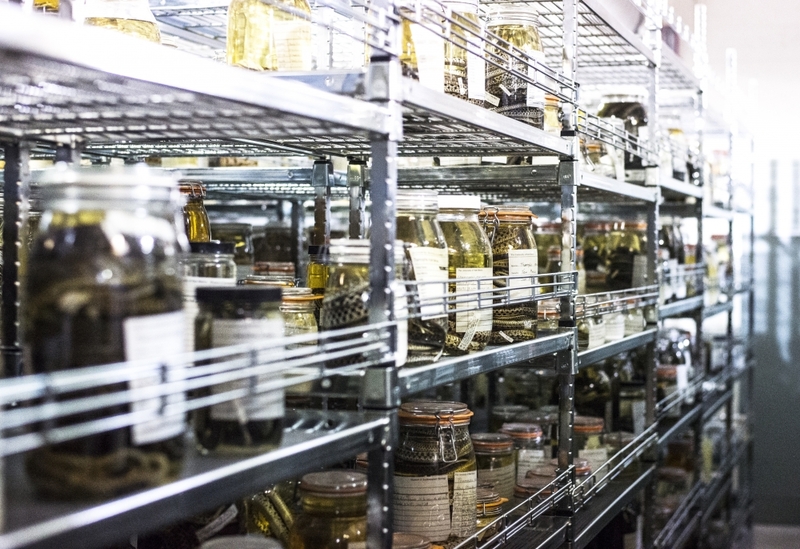 The museum is home to thousands of biological collections, and resides in the lower level of the CERIA building as well as its second floor, where it houses multiple divisions of teams that curate its collections. The museum is made up of these collections, groups of biological specimens that are stored at the museum for a multitude of reasons. Specimens can range from anteater pelts, jarred tape worms, flattened flowers, coiled rattlesnakes and even preserved cockroaches. Teams of curators, researchers, students and volunteers look after these collections and work to keep the museum operational. Schuyler Liphardt is a graduate assistant who works in the division of mammals and helps curate the museum. On a normal day Liphardt said he supervises employees who prep specimens that are to be added into their collections. The different specimens are donated from various sources. “We end up getting huge donations of collections. We have the Illinois Natural History Museum collection, which is about 26,000 specimens. We are getting that collection from (the New Mexico Museum of Natural History and Science). So when we get these really big donations we can have a lot of work. At the end of the summer is when we get a whole bunch because that’s when we go out on expeditions,” Liphardt said. The donations and mass storage of so many species and specimens are used to create a catalog and baseline for future research. Some specimens are upwards to seventy years old, allowing researchers to study them from past to present day. Researchers can use collections like the ones held at the Museum of Southwestern Biology to examine modern day global issues. “Especially now with climate change, the big thing is animals are moving, so then you have these sorts of novel interactions between species that never came together before, and by the research that we do we can sort of describe these interactions. Polar bears and brown bears are coming back into contact again, and through a lot of the genetic work we have done with collaborative labs, (we can) show that it’s not that new of a thing,” Liphardt said. With close to 250,000 mammal specimens and around 100,000 frozen tissues, researchers at the museum can do a lot of novel research, but these studies are not the museums only purpose. Creating and preserving the history of different species, Liphardt said, is the most important aspect of museums in general. Creating a record of change and documentation of our world’s history is of great importance. “If you take a species and you look at the entire history of the species, every single specimen that we have in the collection represents a specific page from that species that is not reproducible,” he said. “You can’t go back and get it again. It’s kind of controversial right now, people are now calling this the ‘Anthropocene,’” Liphardt said. According to the website for the Smithsonian, Anthropocene is a fairly recent term that many scientists have begun to use to refer to the time period when human activity began to have significant impact on Earth. Scientists are not the only ones that can take advantage of the museum; it also can be used as both a place for interdisciplinary studies and community involvement as well. Postdoctoral researcher Stephen Greiman is housed in the parasite division while on a National Science Foundation fellowship to research parasites found in small rodent mammals. He spends most of his time in the parasite division, out in the field or mentoring a high school student. The museum allows students, both within and outside the University, to tour and even work in the museum. For example, Greiman and his high school mentee used DNA sequencing to survey parasites in certain small mammals of the collection. Greiman is assisting the student in a science fair project, and both of them are gearing up to present the students findings to a regional science fair competition. Mentoring is only one aspect that the museum uses to educate the community about collections and their importance. “There is a big National Science Foundation program called AIM UP, and that’s between multiple museums in the U.S. and they are trying to utilize museum collections in education, to help train high school students or undergrads understand why museum collections are important and how you can study different aspects of them,” Greiman said. Apart from educational outreach, the museum also holds an annual open house – the only time the general public can tour the facility – and incorporates different departments around campus. Certain fine arts classes will take tours of the museum and spend time drawing some of the specimens. According to its website, the museum began accumulating its collections in 1928, when Edward F. Castetter slowly started gathering specimens and housing them in the Department of Biology. With the growing influx of specimens and expanding divisions, the museum transitioned into the CERIA building close by. Since its inception in the late ‘20s, the museum has grown into a world-famous research museum with some of the planet’s largest collections, with the work being done by its researchers used for decades to come. Nick Fojud is a student in the communication and journalism department, as well as the photo editor for the Daily Lobo. He can be reached at photoeditor@dailylobo.com or on Twitter @NFojud.